It’s us, Madisons.. You know, from the band? 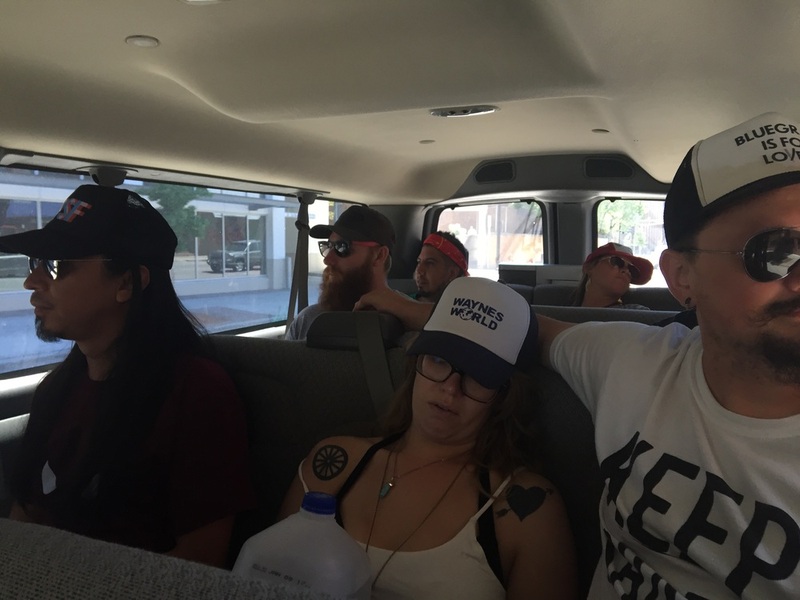 We were supposed to be blogging this whole tour, but, well, someone told us about this thing called “too much whiskey.” Have you heard of it? Its supposed to fix all of your problems. We’re still waiting for that, but maybe we just need to reassess after our tour is over. Here's a quick snapshot of our lives right now: Omar is driving. Driver gets to pick the music, so naturally, we’re listening to Alabama’s “Song of the South.” Heidi’s sitting shotgun. Dominic is sitting in the bathroom section of the van. Separating him from Denise is Tomas’s gigantic wood. I mean bass. Tomas is watching videos on how to play the pedal steel guitar, so stay tuned for some of that sound somewhere in the future of Madisons. Cass is doing something fancy with a computer. She says she’s making us famous. We have no reason not to believe her, except for the fact that she’s about 60% Vodka right now. Nick alternates between snoring and serenading us with his voice and guitarlele. Apparently there’s such thing as a guitarlele. Mike’s writing this blog. (He says, “Hi Mom!”). But before that, he was engrossed with the Madisons in the back, in an intense game of Spades. Very high stakes: Loser gets farted on. And holding it down in the rear, are Dave, Kristen, and Oscar. Dave has been doing his best to sleep for the rest of us. We’re counting on him! Oscar’s FLASH T-shirt belies how slow he’s moving. To be fair, that might be on account of us surprising Oscar and declaring yesterday as his birthday. Kristen’s gigantic hat is preventing me from seeing what she’s doing. I think she’s writing “thank you” cards or postcards or something. We’re on our way from Madison, WI heading to Kansas City, MO. But we had to make a stop in Rock City, IL because SOMEONE left their cymbals there when we recorded for Daytrotter. (Drummers are the WORST!). We’ll try our best to keep this blog better updated in the future. OR WILL WE??!?!?!? !